Hidrex GS 400 is one of the most well known models of iontophoresis device used by hyperhidrosis patients. 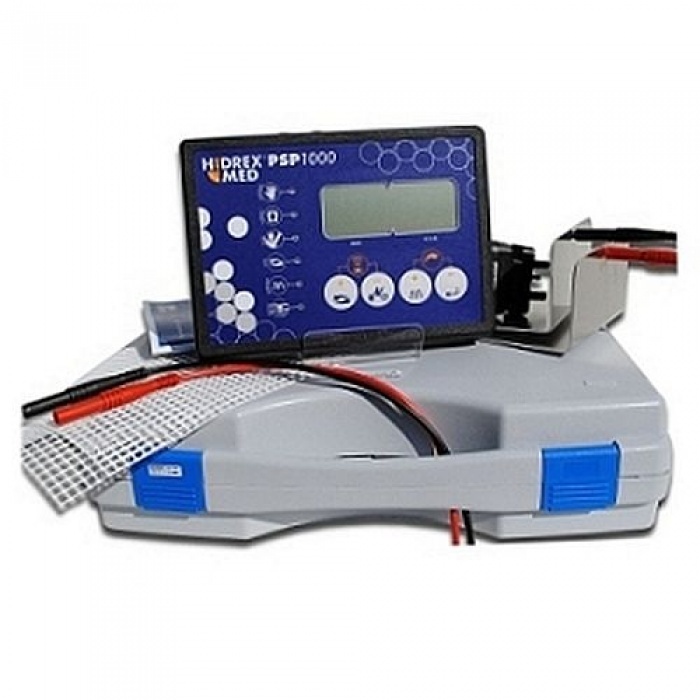 The Hidrex GS 400 is a mains powered, Direct current iontophoresis device. 1 x Hidrex GS 400 contol unit. Have you tried Hidrex GS 400, or know someone who did? Let everyone know how did it go – please write a quick review on Hidrex GS 400 by clicking the button below. I used this machine for treating my excessive sweating of varies areas of my body. There are several things that I liked in this machine over the other. First, Hidrex GS 400 device is easy to operate, treatment is simple to set up and administer. 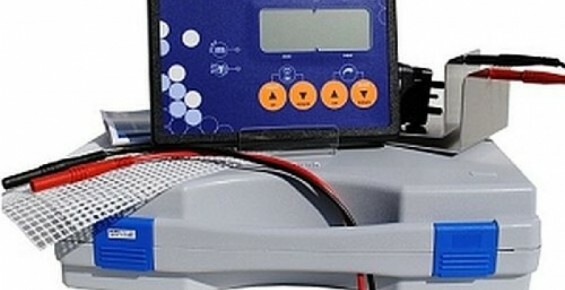 The device features automatic detection. For example, when you place your hands inside the treatment trays, your therapy begins by slowly building up the current, and at the end of the session it will decrease the current slowly back down to zero.Next is that no batteries required to use this. It is a professional electronic device you plug in to a normal outlet.Also with a direct current, adjustable from 1 to 60 volts (in 1 Volt increments), @ 30 mA, I got the most effective treatment amperage and voltage for stopping my sweating. Also, the Hidrex DC has a memory function that remembers the last settings I used.As for the results, I am having quite good one, I have had it 15 days and have done 12, 15 minute sessions for Hands and feet this gave me 95% improvement on hands, the feet I may need to go higher voltage or longer time as they are about 80% improved. I missed a day out to see if it had stopped the sweating properly and it did so I will continue to do a treatment then miss 2 days and so on to hopefully having to do it only once per week. I am very happy with this iontophoresis machine, especially because it's portable and practical. I often have a hectic schedule, so it would be near impossible to keep up with iontophoresis if this wasn't portable. Having said that, I must add that while this device works very well on hands and feet, I cannot use it on underarms. I bought a special Hidrex applicator for underarms, but with this machine, it either hurts or isn't effective. But it's okay, since my underarms sweating isn't that bad to begin with. What matters is that Hidrex works perfectly on my hands and feet - I now only sweat when I skip maintenance iontophoresis treatments, which is very, very rare. Thumbs up! It's great having this kind of device in my own home, so I can have treatments whenever I want. The machine is of professional quality and so are the results. My feet sweating is now almost completely gone. There are no universal settings - everyone needs to experiment before finding the right voltage. I started with 30 volts, it was too strong, then I switched to 15 volts, and finally settled at about 20 to get good results without hurting my skin. It took me about a month to get into a routine and that's when results started showing. Overall, Hidrex GS 400 takes some patience, but pays off eventually. Hidrex is my favorite iontophoresis brand: I tried out various devices in several hospitals over the years (mostly Fischer), and somehow Hidrex treatments felt best, less rough I suppose. Now I finally bought one for myself, and so far all seems good. The fact iontophoresis doesn't hurt a bit means that I can set the current intensity higher. Probably thanks to this, my results with Hidrex are better than any other results in the past! It also helps that now I have the device at home so I can easily adhere to the schedule. I'm a little worried because warranty only covers 2 years, and considering the price, I hope this will last me at least 5-6 years! This reduced my sweating, but to maintain the dryness I need to take 2 palmar treatments a week, and 1 plantar treatment a week. It takes a lot of time... Otherwise, I'm happy with this. A fair amount of research told me I will probably need intense treatments, but just to be sure I tried out my friend's Hidrex PS 500. As it turned out, I required nearly 100% pulse-width to feel even the slightest flow of current, so I decided to save up by buying a direct current Hidrex. The current can be harsh on the upper part of the feet, but I simply apply Vaseline on that area – this solves the problem. I don't use the device regularly, but when I do, it usually takes only about 5 treatments in a week and I'm already sweating less. I'm sure my shoes are even more thankful than I am! This was bad - I had Hidrex GS 400 for less than a month before I gave it up because I couldn't set the current (voltage) to work for me. If I did treatments with very low settings, it wasn't painful, but these treatments were ineffective and my feet and hands still sweated afterwards. Maybe there was a small decrease of sweating in only a tiny portion of my feet, but that was not nearly as good as iontophoresis should be. I couldn't use a stronger current because with higher settings the sensation was very unpleasant and sometimes even painful. I could only hold out for about 5 minutes per session, and that wasn't enough for it to work. At the end I talked to Hidrex customer service - I must say they were very helpful - and negotiated to return this model, pay the difference in price and get Hidrex PSP 1000. It cost me nearly twice as much but was worth it, because it seems that I have very sensitive skin and direct current devices are not effective for me! Using Hidrex GS 400 was a big relief for me in one way: I didn't have to worry about batteries anymore. This is something my old device used, and in the long run it turned out to be annoying. So, I wasn't sorry to pay more for Hidrex, although the ideal price should be lower. About the treatments: I am using Hidrex GS 400 on my feet with complete success. My usual settings include 20V and 25 minutes of soaking, and I apply a bit of petroleum jelly on my feet above water level. Hidrex got my feet dry, so I'm happy. I use it for maintenance every 10 days and it's enough. Unfortunately, with underarms I didn't have that much success. It seems that my armpit skin is pretty sensitive, so it always gets red and irritated in the area where I use iontophoresis sponges. I tried lowering the current intensity, but while it removed the irritation, it also halved the effectiveness of treatments - my underarms would still partially sweat afterwards. In short: Hidrex is easy-to-use, reliable and altogether a good choice for plantar hyperhidrosis, but I wouldn't recommend it for axillary hyperhidrosis.